When planning a multi-course menu, imagination sometimes flags when one gets around to the figuring out of a salad course. The temptation to tear up a few greens and pass the vinaigrette is compelling as the brain wearies of puzzling together a compatible list of courses from aperitifs to dessert. 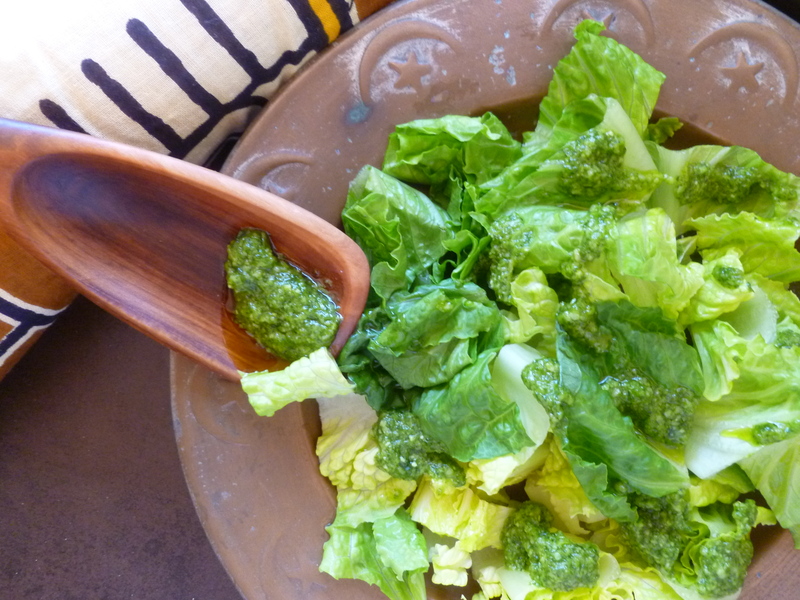 This Salad of Romaine with Arugula Dressing is a simple one. A child–or a cook with many other pans on her fire–could put it together. At the same time, it does not have the ho-hum quality. 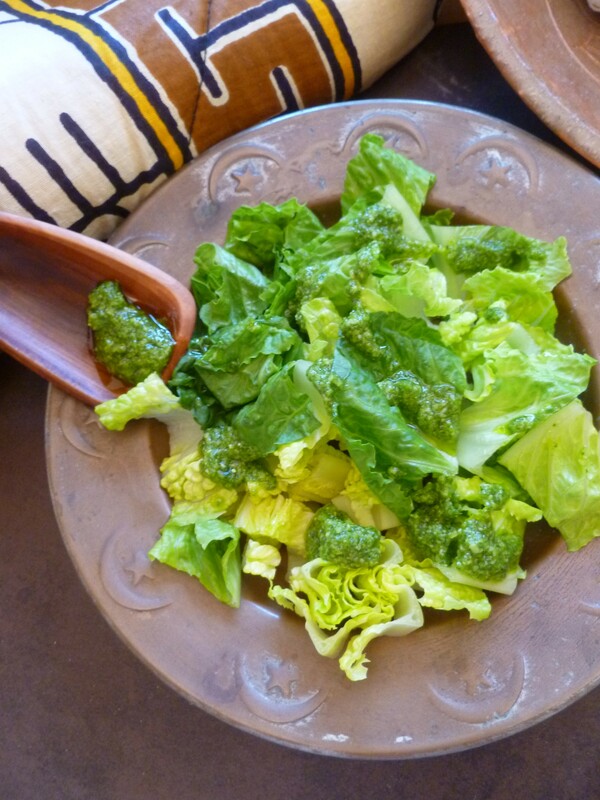 And, if the general composition of the menu is on the rich side, this combination of greens and green dressing serves as a nice counterpoint. Postscript: When this salad is part of the dinner menu: Surf and Turf Chez Laeuchli, baby spinach or Hakurei turnip greens may be substituted for arugula since stir-fried arugula is part of the first course of Queues de langoustes grillées Kinshasa ~ Grilled Rock Lobster Tails Kinshasa Style. Timing Note: The dressing will not suffer if it is made several hours in advance and stored in a glass jar in the refrigerator. Bring it to room temperature before mixing it with the greens. 2 cups of Arugula (aka Roquette): measured in a liquid measuring cup…the measurement need not be too exact. 1. 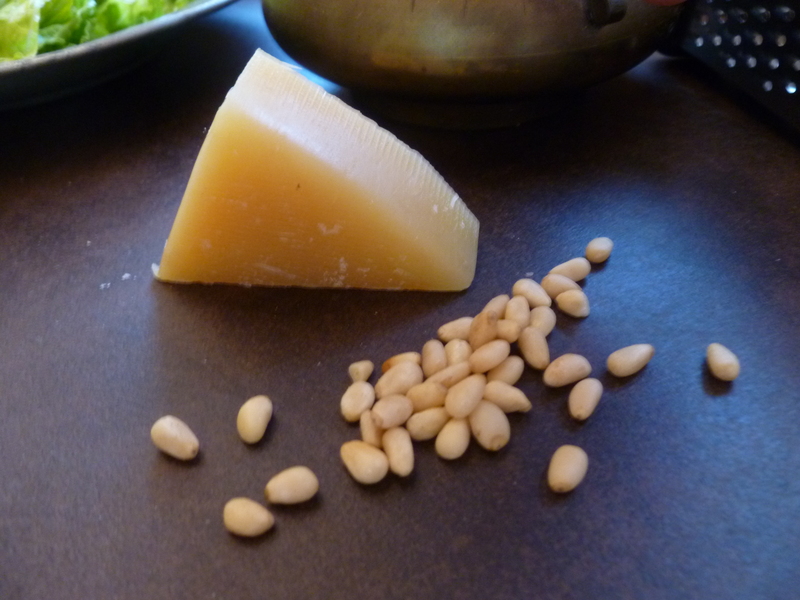 Place the arugula, pine nuts, garlic, and olive oil in the processor or blender and blend them to a smooth texture. 2. Add the Parmesan and process again until the mixture is smooth. 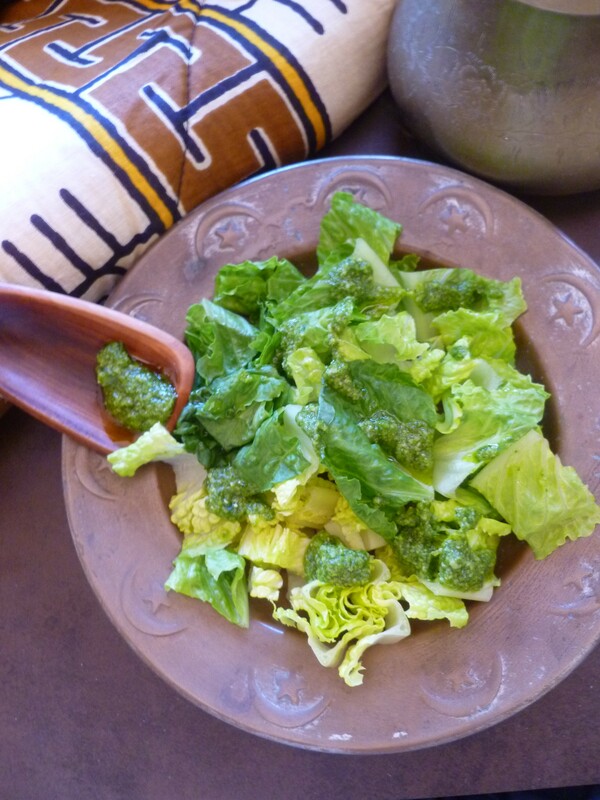 (The dressing may be made in advance and stored in the refrigerator in a lidded glass jar. It won’t lose it’s fresh color. 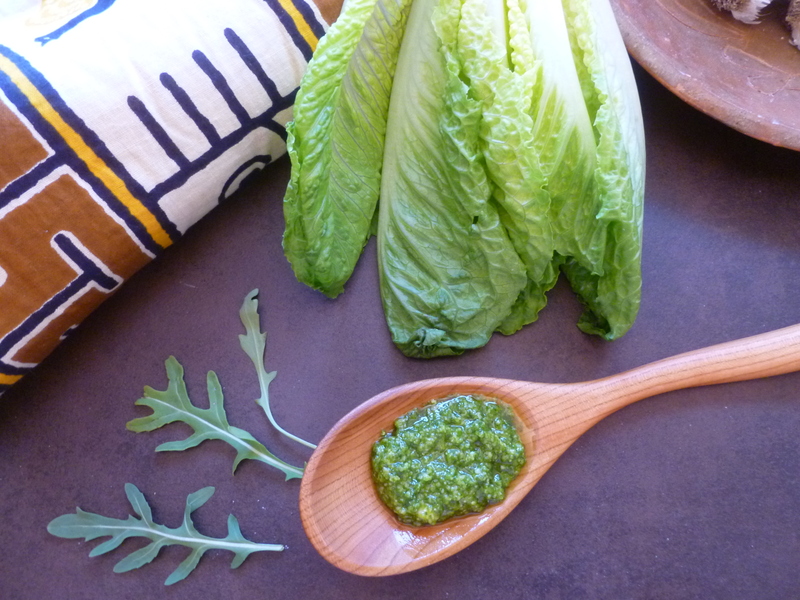 Bring it to room temperature before using it to make the salads. 3. Divide the greens among salad plates. Dot each salad here and there with small spoonfuls of the dressing and serve. Note: Salad of Romaine with Arugula Dressing is the Salad Course (served between the First and Main Courses) of the Dinner Menu: Surf and Turf Chez Laeuchli. 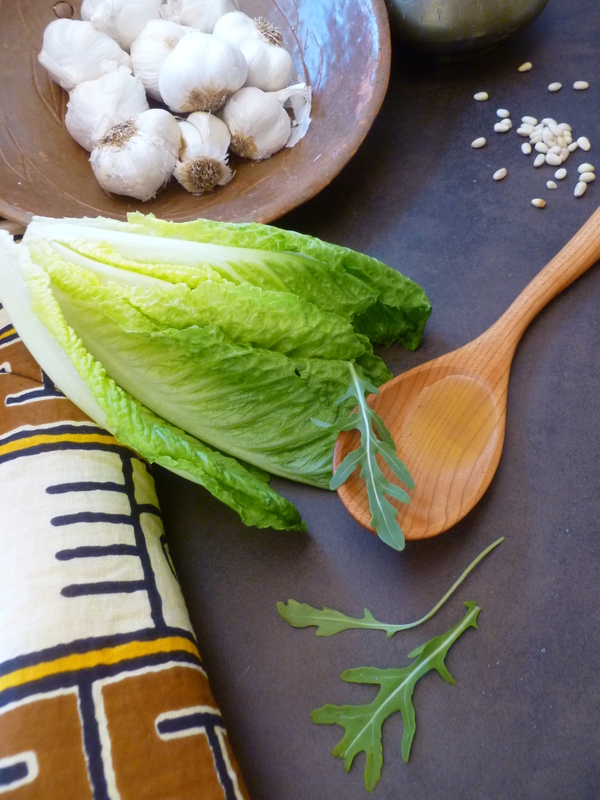 Arugula on romaine – what a clever idea! I must try this soon, thanks for posting!